Life gets so busy for our family that almost every year we somehow forget to plan a vacation. It&apos;s funny, because I&apos;m a firm believer that rest is essential to a healthy, productive life. I try to set aside one day a week for our family to kick back and relax. But a whole week? Well, that&apos;s pretty unheard of. It turns out I&apos;m not alone. 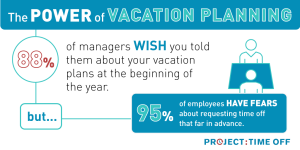 According to Project: Time Off, less than half of us plan a vacation. Out of that group, 64 percent fail to plan a vacation due to the lack of certainty with personal schedule, 57 percent due to lack of certainty with their work schedule and 50 percent due to coordinating their children&apos;s schedules and extra-curricular activities. Well, recently, I learned that today is National Plan Your Vacation Day. And I think I might have to use it as an excuse to plan a vacation this year. So now that I&apos;m sitting here with my planning hat on, let me attempt to help you plan, too. Of course, here at Visit Hendricks County, our goal is to entice you to visit our great county west of Indianapolis. One benefit to staying in Hendricks County is that you&apos;re not only close to some great Hendricks County attractions, but also just a short drive away from other Indianapolis-area must-sees. Fly into the Indianapolis International Airport, which is just a few minutes away, and stay at one of our great Hendricks County hotels. You&apos;ll have a much easier time navigating Hendricks County than staying right in the middle of the city. Day 1: Sky Zone Indoor Trampoline Park. This trampoline park in Plainfield is a great place to take the kids for some fun, plus it helps wear them out so you&apos;ll have a peaceful evening. Pair that activity and the ones that follow with meals at some Plainfield staples such as Oasis Diner, BRU Burger Bar in The Shops at Perry Crossing and Sal&apos;s Famous Pizzeria. The best part about Plainfield is it also contains our largest cluster of hotels in the county just off I-70, so it provides the perfect place to stay. Day 2: The Children&apos;s Museum of Indianapolis. Just a short drive from Hendricks County, the Children&apos;s Museum of Indianapolis is commonly rated as one of the best children&apos;s museums in the country and is one of my favorite places to take my toddler. 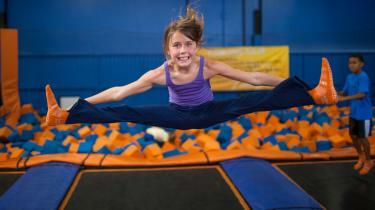 There are tons of fun activities for kids, and this March a new sports experience is opening. Day 3: A day at Splash Island Family Water Park. We love going to Splash Island for some time at the pool. There are some great water slides, and I love the lazy river. They have so much to do that your family will have no issues spending an entire summer day there. Life jackets are available for children, and I love the smoothies at the snack bar. Splash Island also has a smaller, indoor waterpark during the winter months. Day 4: Take in an Indianapolis Indians baseball game in downtown Indianapolis. This is one of our family&apos;s favorite activities. Lawn seats are very affordable, and young children have more freedom to move around. Day 5: Crafting Day. 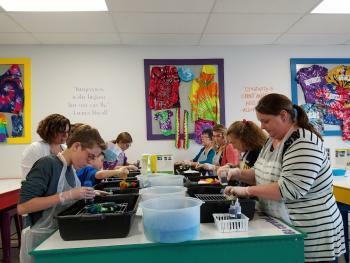 Hendricks County has several DIY crafting places including uPaint Pottery Studio in Plainfield, Bisque Barn and The Tie Dye Lab in Avon, Board & Brush in Brownsburg and more. Some other family-friendly restaurants I recommend outside of Plainfield include Charbonos in Avon and the iconic Mayberry Cafe in Danville. Day 6: The Indianapolis Zoo. The zoo is another one of our favorite destinations near home. We love the animals, White River Gardens and their spectacular dolphin show. Day 7: Monster Mini Golf and Danny&apos;s Mexican Ice Cream. We love this glow-in-the-dark mini golf course and arcade. Proceed with caution, because it might be a little on the scary side for very young children, but it is a great activity for many families. Afterward, head just a short drive down U.S. 36 for some yummy Mexican ice cream. Additional options: Some other family activities that you could fit into this itinerary depending on your preferences include a horseback ride at Natural Valley Ranch in Brownsburg, a nature hike at McCloud Nature Park in North Salem or Sodalis Nature Park in Plainfield, a family movie at the historic Royal Theater in Danville or if your family is into Doctor Who, I highly recommend experiencing Who North America. Day 1: Wine Tasting at Chateau Thomas Winery and dinner at The Coachman Restaurant & Lounge. Stop to sample some wine in the afternoon, then head down the road to The Coachman for some delicious food, and if you go on the weekend, live music out on the deck. Day 2: Tour the Indianapolis Motor Speedway and attend a race at Lucas Oil Raceway. Indianapolis is the racing capitol of the world, and that same racing heritage runs deep in nearby Brownsburg. Take a bus tour around the IMS track and then take in a race at Lucas Oil Raceway. 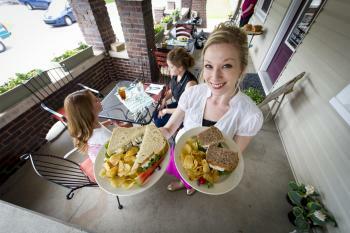 Day 3: Brunch at The Bread Basket Cafe & Bakery and tour the Rural Routes to Main Street Cultural Trail. Be sure to get a slice of pie to go from the Bread Basket to enjoy later. Then hit as many stops as you can on the cultural trail that goes through Hendricks, Putnam and Morgan counties. Day 4 Brown County State Park and Shopping in Nashville, Indiana. Brown County is about an hour away from Hendricks County, and offers great hiking opportunities and a quaint shopping village in Nashville, Ind. 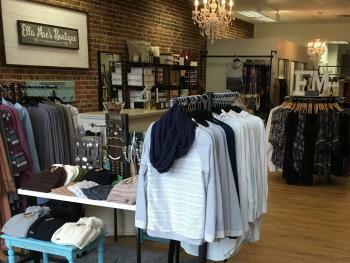 Day 5: Continue your shopping at The Shops at Perry Crossing or one of the several boutiques throughout Hendricks County. Day 6: Go Ape at Eagle Creek Park. Looking for a little adventure? Try this tree-top experience that includes zip-lining through the trees of Eagle Creek Park. My husband and I tried this last summer, and it was a blast. Day 7: Explore the Parks. Every town in Hendricks County boasts an incredible parks system and the county even has several fantastic parks outside of town limits. Check our recreation page for more information. The Visit Hendricks County website is an excellent guide for more information. I hope this has inspired you to plan a vacation this year, and perhaps even to Hendricks County.